Port Washington, N.Y. — Like piano keys falling through the air, Chaos freezes a moment in time with breathtaking elegance. Within each of these multiple bars resides an integrated LED, which is smoothly and evenly distributed by the diffuser. Ultra-thin powered aircraft cables stabilize the suspension, holding everything in place with as little visual interference as possible. All sections of each unique sculptural form is equipped with consistent, highly efficient LEDs for refined illumination throughout. The bars are angled in every direction to create a stunning visual display. A universal driver 120V-220V-277V) is provided within the canopy while the luminaires dim down beautifully with an electronic low voltage or 0-10V dimmer for user control of light output. 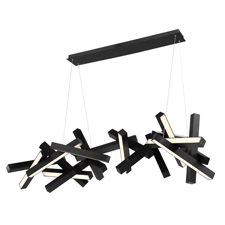 Rated for California Title 24, the pendants are offered in vertical, linear or horizontal configurations. Available in brushed aluminum, aged brass or black. Engineered to the finest detail for unsurpassed performance and design sophistication, Modern Forms is a future-forward manufacturer and innovative brand of unique upscale all-LED luminaires, and a groundbreaking new line of smart interior and exterior ceiling fans. Modern Forms took North America by storm in the last five years with avant-garde designs that leverage advanced LED technology developed exclusively by WAC engineering. Now it is the leading independent provider of technology and modern design in lighting and fans. Modern Forms offers a vast presentation that achieves superior illumination from clean upscale forms only made possible with proprietary LED technology. Premium powder coat and plated finishes, marine grade stainless steel constructed designs, gold and silver leafing, and exclusively developed glass and crystal techniques, are just a few of the features that speak to discriminating specifiers. Modern Forms can be reached at 1-866-810-6615 or visit www.modernforms.com.